Saving money while buying nutritious foods is a great idea. One way to save money is by preparing foods yourself or from scratch rather than paying for the added processing costs of the prepared foods available at the grocery store. When you buy prepared foods, you pay for convenience. You can save a lot of money by washing and cutting up your own lettuce or carrots, slicing your own cheese and slicing sandwich meat from a turkey breast or other meat you cooked. Compare costs. Don’t overpay for convenience unless it’s worth it to you. Let’s see how this works. The cost of food varies from store to store, from area to area, from season to season, and whether or not a special or discount is available. Apply the methods used below to determine if and when buying and preparing from scratch is worth the effort to you. Example 1: Having French fries for dinner. At a store the cost (bought in bulk and on special) of Russet baking potatoes is $1.99 for 10 lbs. The cost of frozen French fries (see Table 1) varies depending on the brand, size of bag and type (regular, thin, thick). To compare the frozen prepared fries with the cost of the ones made from fresh potatoes, calculate the cost of each on a unit price, such as cost per pound. The cost per pound calculations for prepared French fries (in Table 1) shows costs range from $1.40/lb. to $2.46/lb. At home, you can make most of these types of fries from whole potatoes. The cost of fries from whole potatoes is $0.20/lb. Result? There is a savings of $1.20 – 2.26/lb. in making fries from scratch using whole potatoes. Of course, you also have to wash the potatoes and slice them, but if you do not peel them, you keep nutrients and flavor. Only a small amount of additional time is needed to make fries from scratch. Table 1. French fry calculations. Example 2: Look at mashed potatoes. The cost of buying whole potatoes in bulk and cooking and mashing them is $0.20/lb. Compare this with prepared mashed potatoes by calculating each on a unit price of cost per pound (see Table 2). At $0.20/lb. the fresh potatoes, bought in bulk, are the best buy, however instant dry potato flakes come in at a close second. The flakes store longer than fresh potatoes do and take less time and effort to prepare, and, thus, may be well worth your while. All the product forms also take some energy to cook or heat. Table 2. Mashed potato calculations. Frozen mashed potatoes at $3.39/18oz. $3.39/18 oz. = $0.188/oz. $0.188/oz. x 16 oz./lb. = $3.01/lb. Deli mashed potatoes at $2.99/24 oz. $2.99/24 oz. = $0.121/oz. $0.121/oz x 16 oz./lb. = $1.93/lb. Instant dry potato flakes at $2.99/box* $2.99/10 lbs. = $0.299/lb. $0.30/lb. * This box yields 20 prepared cups of mashed potatoes. If each cup weighs 1⁄2 lb., then 20 cups yields 10 lbs. of mashed potatoes. Example 3: Compare making a leaf salad from a head/bunch of lettuce, bagged leaf lettuce or salad already prepared. Bagged lettuce mix costs $1.99/bag (11 oz.). By calculating $1.99/11oz. x 16 oz./lb., the unit price of the bagged lettuce is $2.89/lb. Regular leaf lettuce (green or purple) costs about $1.59/head or bunch, which usually weighs about 1 lb. If it weighs 1 lb. then it costs $1.59/lb. A lettuce-based salad at the deli is $2.89/11 oz., which when calculated for a pound is $4.20/lb. If you do the math you can see that it is well worth it to buy the bunch/head of lettuce and wash and cut it up yourself. 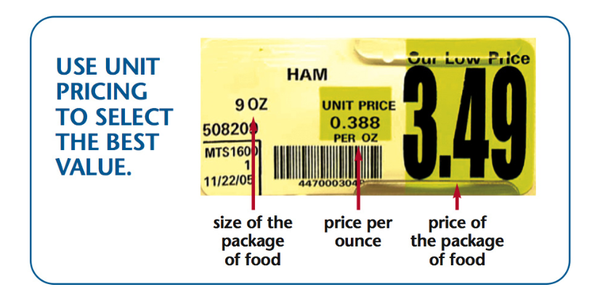 To see if purchasing a prepared food product saves you money over making the food item from scratch, you will need to determine the unit price of each item. Once you have that information, you can decide if the convenience is worth the money. Be sure to compare the prices for the different forms of the product such as fresh, frozen, dried and canned, as well as the cost and size of an individual serving of pre-packaged food products including cookies, muffins, pancakes, rolls and bagels.